Years 6, 7, 8 and 9 at Moyles Court were off timetable for a day recently to support Fairtrade Fortnight, 26 February – 11 March, taking a hands-on approach to Global Development Day. During the Fortnight, Moyles Court students undertook a variety of activities and workshops designed to encourage an active and responsible attitude towards a range of global inequalities and development issues, such as poverty and interdependence. Students were able to talk to a representative from Traidcraft to find out about their work in supporting producers in developing countries, and the difference we can all make to their lives just by buying Fairtrade products. A speaker from Oxfam talked about the work that this charity does to reduce poverty in so many countries, from providing emergency relief through to long-term aid projects to provide clean water, education, improved healthcare, and more. The students were told about gender-inequality in different countries, as well as the environmental issue of climate change. Some students had a go at making clay pots and carving wooden spoons and learned how to weave willow to make a platter – helping them to realise the skill, patience and hard work that goes into producing objects that we take for granted every day, and how easy life is in the UK with the machines and so many gadgets to do the hard work. Other students followed the story of cotton from seed to garment – a long process involving some very poor conditions, but which Fairtrade is improving. Students then decorated their own Fairtrade cotton bags to promote this cause. It was a different day for the Year 9 students who spent the day with ‘Sunrise Bushcraft’ and found out just how hard life can be trying to survive without all of the modern conveniences. 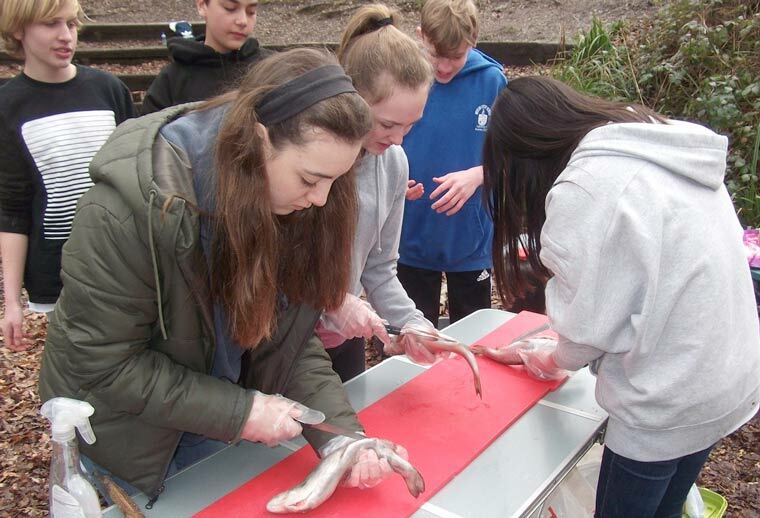 Preparing their own lunch involved gutting and filleting the fish, which proved quite a challenge as none of the children had attempted this before. They had to prepare and start a fire, gathering the correct types of sticks needed and using a variety of techniques to get the fire going, and keep it going. They also had to learn how to use a knife to carve their own tent pegs. In the afternoon, they tried their hand at shelter building – learning from their first attempt that it is important not to use dead or rotten wood as the weight of the other material on top will lead to it collapsing, but once covered thoroughly, the shelters can last for weeks. However, the students apparently admitted they preferred their home comforts.